This beautiful, modern and very luxurious villa was built in 2010 and is tastefully decorated. The villa has a garden with a large swimming pool and a large covered terrace. Besides a lovely garden and the charming décor, the presence of a massage shower and whirlpool bath will make your holiday an unforgettable experience. From the house you look out over the beautiful rural and hilly surroundings. 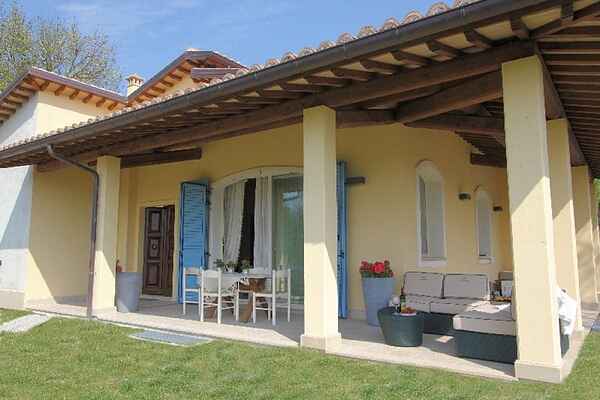 The villa is located 2 kilometres from the atmospheric Acqualagna where you can go for your daily shopping. A stones throw away is the magnificent Furlo natural reserve. The area extends over 3,600 hectares and has exceptional flora and fauna. For example, deer, wild boars and even wolves live there. Lovers of truffles have really come to the right place in this area, as the region is known for its many truffles, which can be found here. Furlo also houses one of the oldest truffle farms. Fano is highly recommended. This ancient Roman city is 45 km away and is on the coast. Visit the beautiful sandy beaches or one of the rocky bays. You enter the ancient Roman city centre through the more than 2,000 year old Porta Augusta .